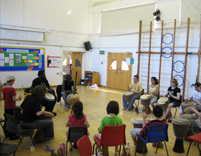 Jali Djembe run African druming workshops for various organisations - schools, colleges, universities, community and youth groups and companies. Contact us for more details. ::: Jali Djembe run regular West African djembe and percussion workshops for all ages and abilities teaching authentic traditional African rhythms. ...and most of all is fun! 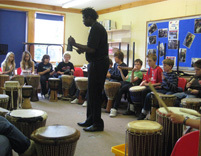 African percussion club every Thursday evening: 8.00 - 9.30pm. 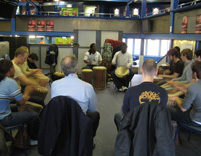 Join Mod'Lamine's African djembe workshops - suitable for beginners and improvers. Learn authentic african rhythm from a true master. Dorking Christian Centre, Church Street, Dorking, Surrey RH4 1DW. £9 per session, drum hire £1. "A million thanks for a great two day work shop. You gave our students at St Peter's School in Guildford an amazing cultural, spiritual and musical experience. What a great final master class and performance!" Jali Djembe have an Enhanced CRB check and Public liability insurance.